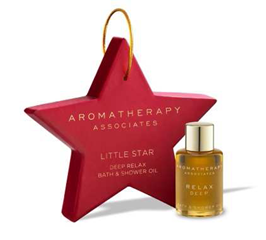 Aromatherapy Associates SHINING STARS CHRISTMAS COLLECTION has arrived. The limited edition collection comprises six stunning gifts, presented in seasonal deep red & gold packaging and finished with a pretty grosgrain ribbon - sure to impress any lucky recipient this festive season. Gifts include the Little Star (£10.00), Perfect Partners (£15.00), Perfect Partners Candles (20 hrs burn time, £25.00), Hand Wash & Hand Lotion Set (£25.00), Comfort Candle (42 hrs burn time, £45.00) and an Ultimate Bath & Shower Oil Collection (£49.00).